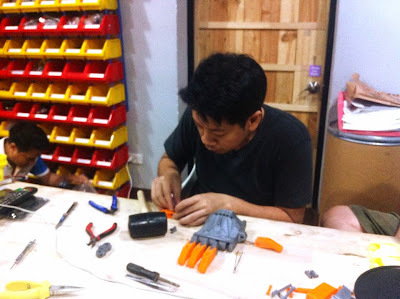 May 12, 2015 -- ProgressTH Bangkok-based makerspace, MakerZoo, is working on improving existing, open source prosthetic limbs that have already helped revolutionize and empower many missing limbs either from birth or from accidents. 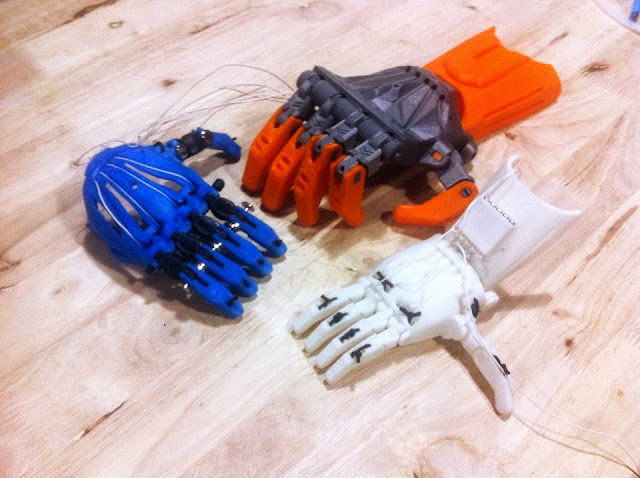 The original project called e-NABLE has created an open source 3D printed series of prosthetic limbs that have been printed out and distributed around the world through a growing network of volunteers and organizations. Despite the many advantages including easier accessibility to prosthetic limbs, cheaper costs, and better customization, there are still many flaws in many of the designs. The e-NABLE project depends on people testing and improving the designs locally under various conditions to improve the overall quality of their growing line of prosthetic limbs. MakerZoo's Sasapol Bumrungcheep (P’Ta) has printed out and assembled many of these limbs and is seeking to distribute test pieces to local Thais to gather feedback on their strengths and weaknesses. Then, by using 3D printing and other tools and talent found at MakerZoo, he plans on improving the design and creating a network to distribute the improved limbs across Thailand and beyond. Last Sunday, Post TV paid MakerZoo a visit to see the progress P'Ta has made. The previous night, several hands of various sizes were printed out and during Post TV's visit, they were assembled and tested. Now MakerZoo is reaching out to local schools for the disabled and looking for those interested in testing out the limbs. Combining 3D printed parts and other materials will hopefully reduce the weakness associated with plastic. Adding in additional functionality to the limbs will hopefully improve the ability of users to pick up and hold a larger variety of objects and complete a larger amount of tasks with their new artificial limbs. Another area of improvement is form. Missing a limb can have a profound psychological impact on an individual. By giving them a prosthetic that is designed beyond a mere medical device, and instead, more like an accessory can greatly improve the confidence of a user. Through improved form and function, P'Ta and the team at MakerZoo seeks to take this amazing project to the next step and by doing so, hopefully establish a growing ecosystem of open source, decentralized biomedical technology that is cheaper, better, and more accessible than what is currently out there.